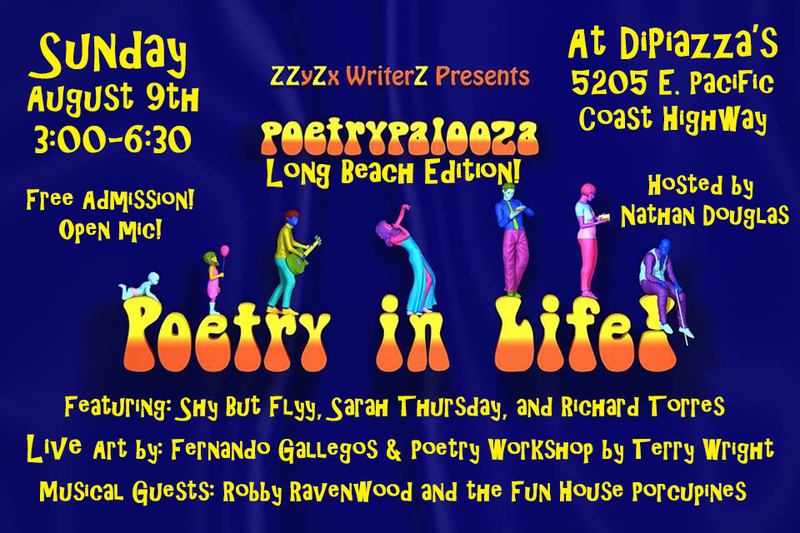 For the second year in a row, I am joining forces with the ZZyZx Writers on the Poetrypalooza Tour! This year, we’ll be at DiPiazza’s on August 9th from 3:00-6:30. Hosted by Nathan Douglas, this event features many amazing talents such as Shy But Flyy, Richard Torres, Terry Wright, Fernando Gallegos, and musical guests Robby Ravenwood and the Fun House Porcupines. Come out for a fun filled afternoon, stay for some of the best pizza in town! Previous Post Gatsby Books Turns 5!